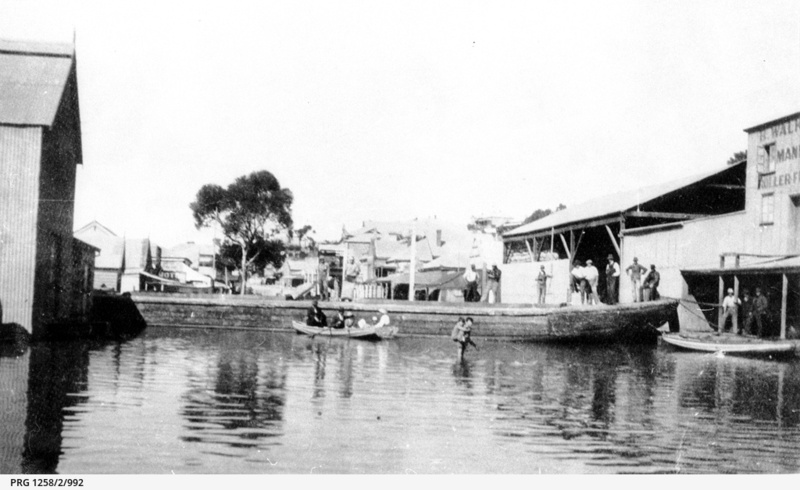 Mannum flood, with 150 ton barge 'Pearl' across the street, several people standing at the bow, a rowboat with passengers approaching, and a young boy piggy-backing another boy across the street. The caption notes 'Pearl never touched bottom in the 1917 flood'. Although this image appears in the 1931 flood sequence in the Godson album 'Mannum Flood', comparison with PRG 1258/2/981, shows it more likely belongs with the 1917 flood sequence.